There is a story inside every Monroe Community College student. Before enrolling at MCC, Jon Dretto’s story included hours of practicing guitar and wondering if he would succeed in college. Katherine Porzi intentionally shadowed health care and education professionals before confirming her major. Jaimee Prass learned how to navigate the differences between the United States’ educational system and that of her native Guyana. During the past year, more than 3,300 students like Jon, Katherine and Jaimee shared glimpses of their personal stories when applying for scholarships or emergency financial support to finish the semester. We are privileged to help make college a reality for so many students in our community. We are also grateful for the ability to help students overcome unexpected financial “plot twists” that threaten their higher education dreams. In today’s world, academic success relies on more than computers, books and time spent studying. It requires financial resources and hard work. In 2017-2018 alone, the MCC Foundation awarded almost 900 scholarships to deserving students. Unfortunately, for each scholarship recipient there are three or four students who apply but do not receive the financial support they need. The need for scholarship and emergency financial support is growing. You helped Jon, Katherine and Jaimee graduate in June with little or no debt and transfer to continue their educations. As dedicated volunteers and supporters, you have also helped make the MCC Foundation, now in its 35th year, a role model for other college foundations around the nation. Thank you for empowering our students and helping MCC inspire every day. Without you, many of our students would face difficulties and delays in achieving the happy ending they desperately want and definitely deserve: rewarding career opportunities. Timothy “Bernard” Butler (pictured at top of page) is a father who cares deeply for his five children and the Rochester community. A Navy veteran, Bernard served for eight years in the U.S. Atlantic Fleet. After leaving the Navy, he worked in food service, but envisioned leaving the kitchen behind for an office of his own. Bernard started a new chapter of his life when he enrolled in Monroe Community College’s Hospitality Management program. He trusted that MCC would help move his life forward to benefit himself, his family and his community. When you give to the MCC Foundation, students like Bernard earn the college credential they need to start rewarding careers, support families and fulfill their potential. Students can also turn to innovative programs like Dreamkeepers and Save for Success in order to overcome unforeseen circumstances that otherwise would derail their plans to graduate. The Foundation transferred more than $2.6 million to MCC during 2017-2018 alone thanks to you. Bernard’s story is far from finished, but we have no doubt his path has been forever changed through support from caring community members. Thank you for the hundreds of MCC success stories you created during the past year and the many new chapters yet to be written. Since 2010, private donors working in conjunction with the MCC Foundation have continued to raise scholarship dollars for deserving MCC students through the Every Bright Future Needs a Strong Foundation campaign. Knowing the MCC-educated workforce adds approximately $737.9 million in income to Monroe County each year, the campaign ensures that MCC remains a force behind our region’s economic stability and workforce development. The true cost of education includes more than tuition. Students need to pay for books and equipment, transportation to and from campus, room and board, and even childcare expenses. Tuition-free college does not negate the need for additional scholarship assistance; in fact, it may even increase the demand for scholarship support at MCC because it creates greater access to higher education for even more students. MCC scholarships continue to be a wise investment—keeping students on track for success and ensuring that our brightest graduates reach their potential here at home. Unrestricted giving is critical to MCC because it enables the college to respond immediately to individual student needs and opportunities to build a strong community and workforce. The Annual Fund for Monroe Community College is a powerful resource that helps students stay on track and provides seed money to enhance learning experiences and grow programs and community partnerships. Students began taking classes at MCC’s new Downtown Campus in September 2017. The campus, located at 321 State Street, is a dynamic, collaborative and welcoming learning environment that matches the aspirations of MCC students and the needs of our community. The E. Kent Damon Legacy Hall, presented by the MCC Foundation on the fourth floor, offers an overview of MCC’s history of leadership and innovation in higher education for the citizens of Monroe County. The hall honors Xerox Corporation executive and founding MCC Trustee E. Kent Damon, who consistently encouraged investment in MCC both from Xerox and the Greater Rochester community. Students, alumni, faculty, retirees and friends demonstrated their MCC spirit during Alumni Week and Homecoming events in early October. Attendees helped raise more than $36,000 to support student success during a series of events that offered something for everyone, from an art exhibit and soccer match to an Alexander Street Campus alumni gathering and Spirit Day activities. 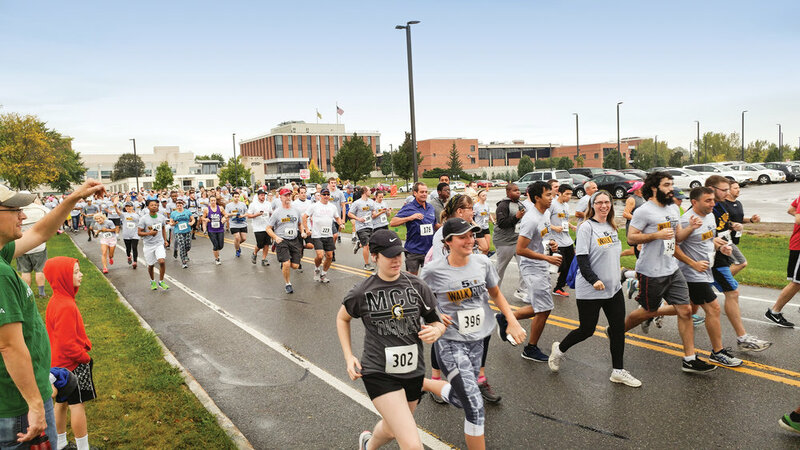 More than 460 people participated in the annual 5K Walk/Run for Scholarships, where six students received scholarships following the race. Celebrations were also hosted at alumni-owned businesses, including Rochester Arc + Flame Center and Simply Crêpes. In January 2018, Corning Incorporated Foundation awarded a $760,000 grant to further expand MCC’s Optical Systems Technology associate degree and certificate programs. Corning’s partnership and generosity over the past five years have made it possible for the college to open a new optics laboratory and expand classroom space at the Brighton Campus to accommodate more students. This most recent grant also helps reinforce MCC’s connections to local high school optics programs through tuition assistance for students who participate in dual-enrollment courses and professional development opportunities for high school teachers. As retired Corning Incorporated Foundation President, Karen C. Martin says, “MCC understands the needs of employers who need technicians who are career-ready with a college credential.” A director on the MCC Foundation Board since 2014, Karen regards Corning’s support of and partnership with MCC as a proven, strategic way to attract and educate future optics professionals. Motivated by faculty mentors and scholarship awards, more than 100 Monroe Community College students presented original research at Scholars’ Day events at the Brighton and Downtown campuses in April. Thanks to the generosity of ESL Charitable Foundation, Xerox Foundation and other MCC supporters, 31 students received scholarship awards totaling $25,000 and the opportunity to meet the event's keynote presenters, Kiva co-founder Jessica Jackley and best-selling author and scholar Reza Aslan, at an exclusive awards luncheon. This year’s Scholars’ Day event also marked the debut of Launch Your Business!, an initiative made possible by a $250,000 grant from the Everyday Entrepreneur Venture Fund (EEVF) and the generosity of Chip and Stuart Weismiller. Nineteen student-entrepreneurs pitched new business ideas for Rochester through Launch Your Business! and the top six received scholarships and opportunities to take their business plans and ideas to the next level. MCC is among four community colleges selected to be part of EEVF’s national effort to help students and recent alumni become successful entrepreneurs in their local communities.